October has become a month when the residents and businesses in Thurmont go all-out to fight breast cancer. This year was no different, with Thurmont raising $18,000 for its 5th Annual Gateway to the Cure. With this year’s donation to the Hurwitz Breast Cancer Fund, Thurmont has raised $62,000 over five years. 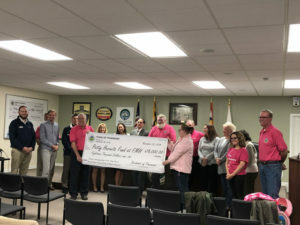 With the Thurmont Mayor and Commissioners wearing their pink T-shirts, they held a meeting to present the town’s annual donation to the Hurwitz Breast Cancer Fund. Thurmont Main Street Manager Vickie Grinder reminded the commissioners and mayor that when the town began its efforts in 2014, they were hoping to be able to sell a case (122) of pink light bulbs. Jeff and Patty Hurwitz created The Hurwitz Breast Cancer Fund at Frederick Memorial Hospital in 1999. Patty had been diagnosed with breast cancer, and the couple believed that early diagnosis had helped improve her chances of beating cancer. The fund is used to help improve ways of diagnosing and fighting cancer in the county. The fund has raised $1.7 million to date. That money has gone to purchase things, such as a machine for biopsies and another for 3D mammography. Every dollar donated to the fund is used for direct patient benefit, and there are no administrative costs. During October, the Town of Thurmont sold pink light bulbs, sold Gateway to the Cure merchandise, sponsored “Paint a Lighted Wine Bottle” afternoon, held a Zumbathon at the American Legion, held a 5K race, and planted a pinwheel garden in honor of loved ones and survivors of all types of cancer. Nearly fifty businesses and groups also participated in the Gateway to the Cure by holding their own fundraisers to contribute to the town’s donation. Catoctin High Football Team and Cheer Squad sold pink T-shirts to be worn during the pink-out games. Thurmont Historical Society donated a portion of its new member and returning member membership fees. Gateway Orthodontics donated money for each set of braces patients purchased and sold pink mouthguards. Timeless Trends held a night of pampering for people with local wine, food, and services. Roy Rogers donated a portion of the strawberry shortcake sales for the month. Simply Asia donated a portion of its customers’ checks. Woodsboro Bank held Pink Fridays where employees could pay to wear pink on Friday, sold merchandise, and paid for each Facebook like their page received. Criswell Chevrolet donated a portion of the cost of each oil change performed in October. The thing that many of these participating businesses had in common is that they had employees, members, family, or friends who had been diagnosed with breast cancer. Some had fought it and won. Others had died from the disease. These businesses and groups wanted to help find a cure or at least more-effective ways to treat breast cancer. The $18,000 donation is not only Thurmont’s largest donation to date, but it is also 20 percent more than was donated in 2017. “This town is just amazing, and you should be commended for that,” Jeff Hurwitz told the commissioners. Thurmont’s involvement in the Gateway to the Cure started in 2014 with Commissioner Wayne Hooper, whose wife Jill is a breast cancer survivor. Since that time, Grinder has been coordinating the town’s efforts to help find a cure. Thurmont raises $18,000 for its 5th Annual Gateway to the Cure and presents check to Patty Hurwitz Breast Cancer Fund at FMH.